The trap can be made using scraps of lumber, but flat and wide enough and tall enough for a rabbits body. Or, you can use a hollow log. The key to the trap is the triggers, # 3 and the door, # 2. Of course the rabbit, # 1 is important too. The support Y is cut from a tree limb, # 4 and holds the thin piece of wood or limb that balances on it. Use fishing line to secure the trigger and the door to the balance limb and a eye-screw or nail can be used at the top of the door. The door is installed from two thin strips of wood just a little wider than the door is thick, on both sides of the trap. This means your trap MUST be longer on the sides than the top, to allow the door to fall freely. 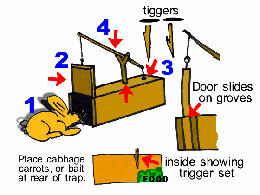 The rabbit enters the trap, smelling the food (at the rear of the trap) he moves toward it, hits the trigger, which allows the balanced limb to be released and the door to close behind him. Use caution removing the rabbit, he may turn around in the trap, but most are caught with the feet toward the door. The rear of the trap can be solid wood, or I like to use a thick mesh wire, so the scent of the bait is in the air. Place the trap on known rabbit trails and your in business. Also, check your local fish and game laws to see if you can use this trap in your area. 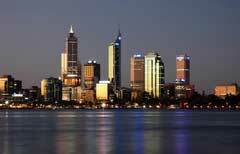 A special permit, trapping or other type, may be needed.